Ethical leadership research has primarily relied on social learning and social exchange theories. Although these theories have been generative, additional theoretical perspectives hold the potential to broaden scholars’ understanding of ethical leadership’s effects. In this paper, we examine moral typecasting theory and its unique implications for followers’ leader-directed citizenship behavior. Across two studies employing both survey-based and experimental methods, we offer support for three key predictions consistent with this theory. First, the effect of ethical leadership on leader-directed citizenship behavior is curvilinear, with followers helping highly ethical and highly unethical leaders the least. Second, this effect only emerges in morally intense contexts. Third, this effect is mediated by the follower’s belief in the potential for prosocial impact. 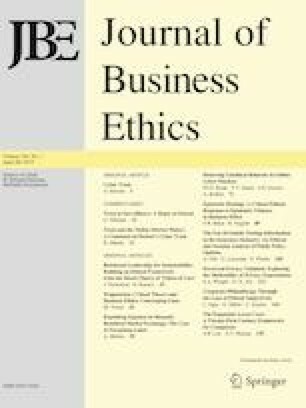 Our findings suggest that a follower’s belief that his or her leader is ethical has meaningful, often counterintuitive effects that are not predicted by dominant theories of ethical leadership. These results highlight the potential importance of moral typecasting theory to better understand the dynamics of ethical leadership. We thank Christopher Barnes, Terry Mitchell, and Scott Reynolds for constructive comments on earlier drafts of this manuscript. John is Chief Director of a medical research laboratory in the United States. He currently has 50 full-time employees working in his laboratory. The mission of his lab is to conduct research to help eradicate cancer in the United States. In the past few years, his lab’s research has made major medical advances, influencing government policy and promising to improve the lives of thousands of people. As a leader of the team, John always has the best interests of his employees in mind and always listens to what employees have to say. The decisions he makes at work are widely regarded as fair. He defines success not just by results but also the way they are obtained. John’s employees often regard him as a person who leads with moral conviction. Several visitors to his lab have also made praiseworthy comments about the values that underlie his leadership. As the leader of the team, John rarely keeps the best interests of his employees in mind and rarely listens to what employees have to say. The decisions he makes at work are widely regarded as unfair. He defines success by results, but is indifferent about the way they are obtained. John’s employees often regard him as a person who leads without moral conviction. Several visitors to his lab have also made critical comments about the values that underlie his leadership. John is Chief Director of a geology research laboratory in the United States. He currently has 50 full-time employees working in his laboratory. The mission of his lab is to conduct research to help identify different types of rock formations. In the past few years, his lab’s research has made some moderate advances, increasing geologists’ understanding of rock formations.